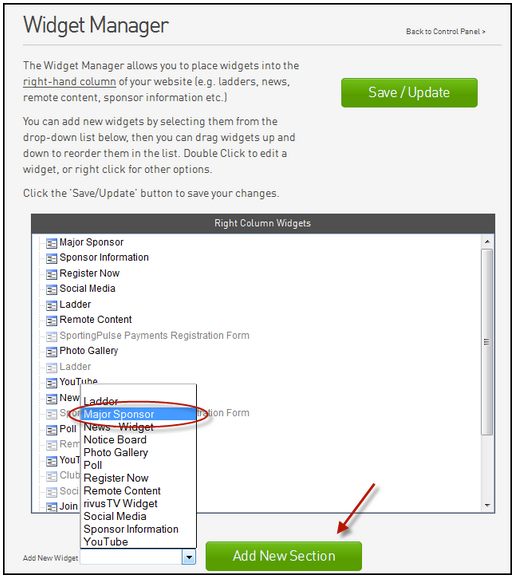 The Widget Manager section is used to activate and modify your widgets. A widget is an application, or a component of an interface, that enables a user to perform a function or access a service. If you aren't able to access the website editor function for your Club website (either the previous editor is no longer at the Club, or the site hasn't had an editor before), then please click here. Alternatively , if your website already has a website editor, this person can authorise you as an additional website editor themselves. If you are a club, you must contact your Association for access. Firstly, scroll down to the bottom of your website and click 'Site Editor'. 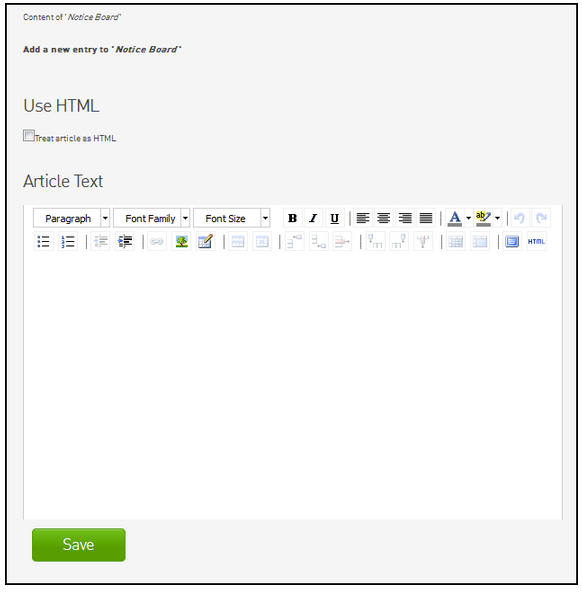 You will then be shown the Website Editor Control Panel. This function displays news content from an external website in the right hand column of your website. There are a wide range of remote news sources to choose from. 1. From the Website Editor Control Panel, click on Widget Manager. 2. 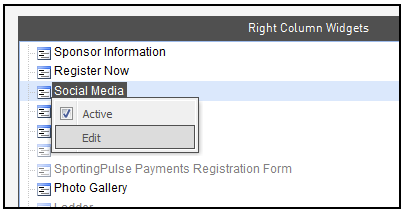 Click on the Add New Widget drop down list, select Remote Content, and click on Add New Section. 3. Right click on the Remote Content section and select Edit from the menu. 4. Click on Choose/Change Source. 5. The Search/Browse window will appear. This enables you to either (a) hit the Browse button to view all news feeds available or (b) enter a search term (eg. 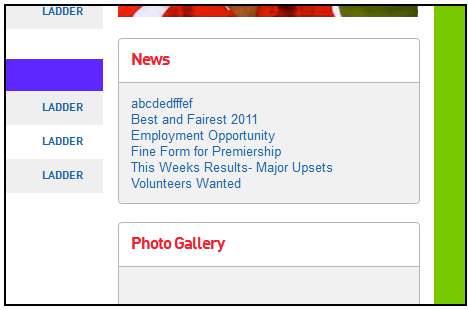 type in ‘AFL‘ to search for all news feeds with ‘AFL' in the title) and click on Search. If you have submitted a search, it will return all results for that search. 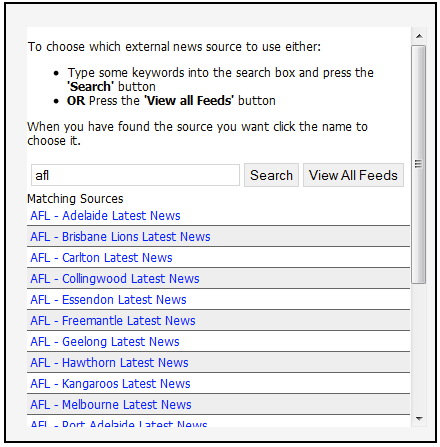 If you click on View All Feeds, it will show a list of all Remote News Feed sources. Scroll through the list to find the news feed you wish to use. 6. ​Click on the name of the remote news feed to select it. 7. A confirmation screen will appear with the remote news feed you have chosen. 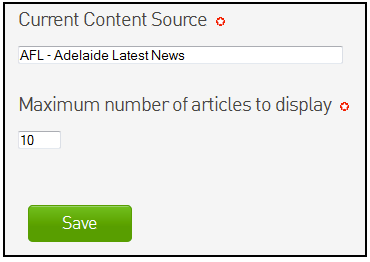 Enter the maximum number of articles to display in the right hand column (compulsory) and click on Save. 8. You can return to the Remote News Feed at any time and change the news source by clicking on the Choose/Change Source button. 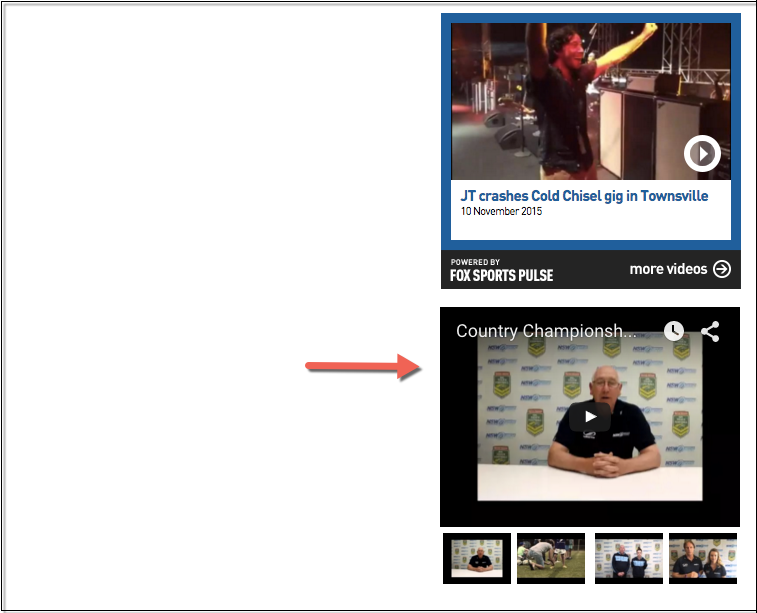 A news feed from your website‘s news section can be shown on the right side of the page. This is different to a Remote News Feed, which brings in news from an external website. From the Website Editor Control Panel, click on Widget Manager. 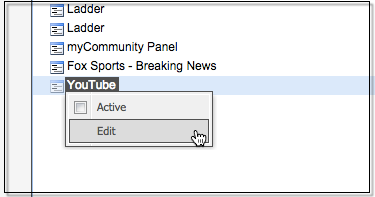 From the ‘Add New Widget‘ drop down list, select ‘News - Widget‘ and click on Add New Section. Right click on the News - Widget in Sidebar section and select Edit. There are two options on the Edit screen – (1) select the News section to feed from, and (2) set the maximum number of articles to display. Set your preferences and click on Save. Return to the Widget Manager. Right click on the ‘News - Widget‘ section and this time select Configure from the menu. There are two options for how the News Feed appears in the right-hand column widget – (1) select between showing news headlines or photos, and (2) whether to show the section name (eg. Latest News) as the title for the news feed. Make these selections and click on Save. 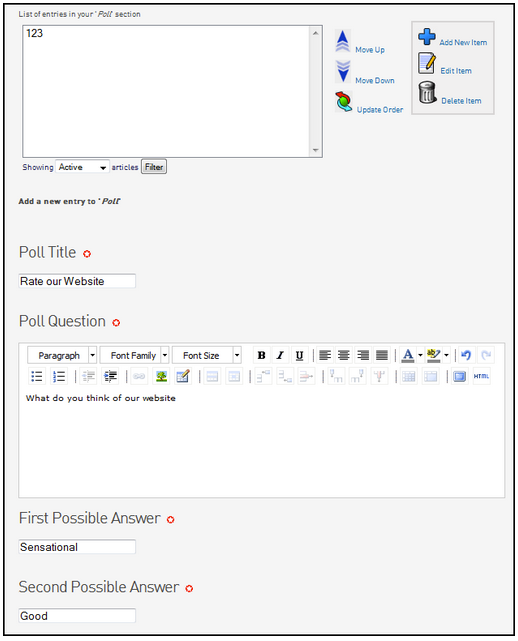 This section allows you to set up an opinion poll in the sidebar of your website. Site Members can vote on a poll and then view the poll results. 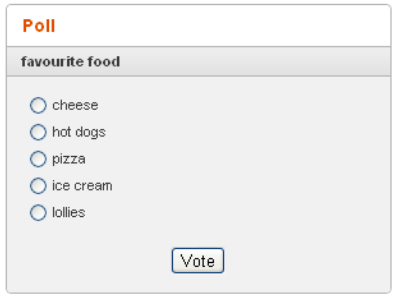 You can change the poll as often as you like, but only one poll can be displayed on your website. 2. If your website does not already have a Poll, click on the Add New Widget drop down list, select Poll, and click on Add New Section. 3. Right click on the Poll section and select Edit. 4. The currently active poll will be displayed at the top of screen. Below this will be blank fields for creating a new poll. Enter the details in the fields provided and click on Submit Opinion Poll. 5. Each time you add a new poll, the new poll will become the currently active poll on your website and the previous poll will be added to the archive. To view archived polls, click on the ‘Showing‘ drop down box and select ‘Archived‘. This widget (as distinct from the Sponsor Information widget) can display information about your major sponsor, including their logo, title and description (and links to their websites) at the top of the right hand column of your site (i.e. above the island advertisement). 2. 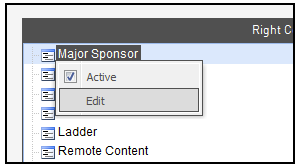 Select Major Sponsor from the Add New Widget drop down list and click on Add New Section. 3. 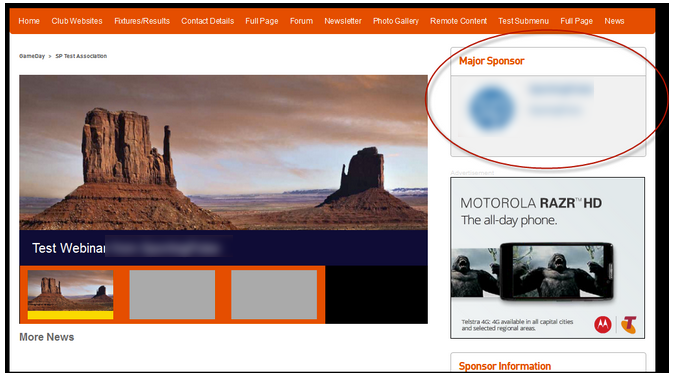 Right click on the Major Sponsor section and from the menu select Edit. 4. 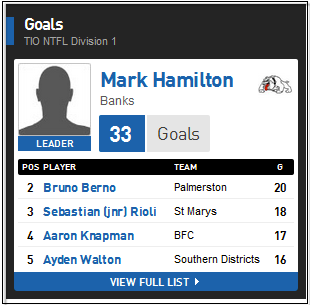 From the Edit screen, enter in the information relating to your sponsor, and click Save at the bottom. You can then add additional sponsors by clicking Add New Item, or edit any sponsor information by selecting the sponsor from the list and clicking Edit Item. PLEASE NOTE: This widget is not linked to the Sponsor Information section (in the Content Manager) or Sponsor Information widget in any way; these are separate sections that need to be maintained separately. Social Media Widget The Social Media widget allows you to add a link to your Facebook and Twitter pages, as well as displaying your latest Twitter news feed. 2. 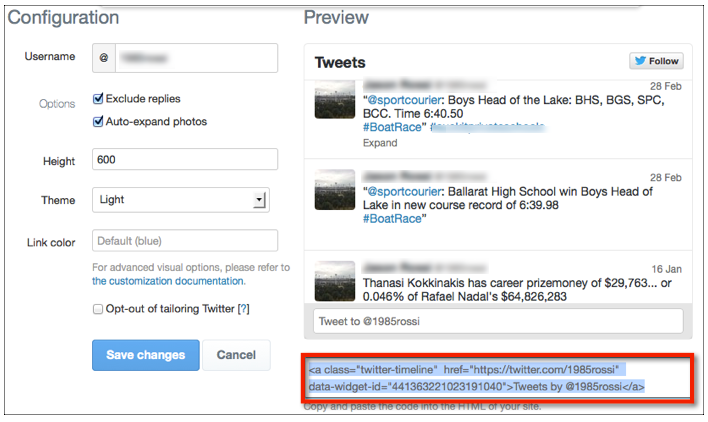 Select Social Media from the Add New Widget drop down list and click on Add New Section. 3. Right click on the Social Media section and from the menu select Edit. 5. You will see a new field called New Twitter code on this page you wil first need to click the Click Here link. 8. Copy the code created HTML code. Please note that not all the code you copied will appear in the text box after you save as it is not all required to display the widget on your site. The Photo Gallery widget displays a collection of the most recent photographs you’ve uploaded to your Media Library. 2. 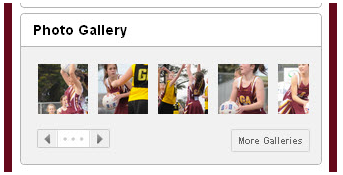 Select Photo Gallery from the Add New Widget drop down list and click on Add New Section. 3. 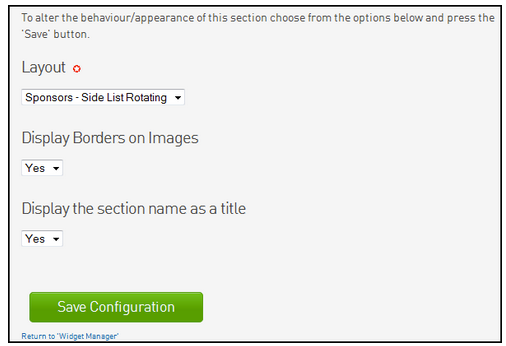 Right click on the Photo Gallery section and from the menu select Configure. 4. 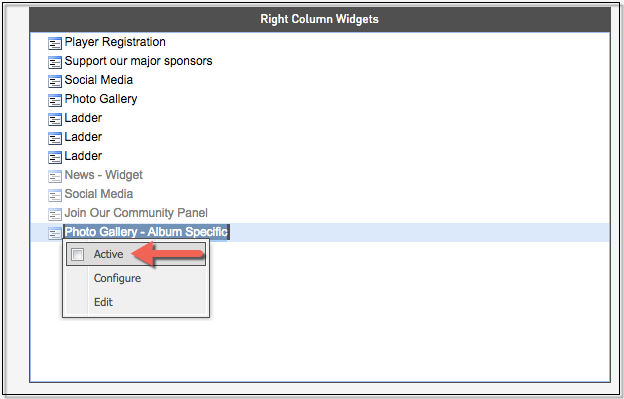 From the Configuration screen, select a layout for how you wish to display your Photo Gallery widget, and click Save at the bottom. There are two configuration options - either with a larger image feature (Photo Gallery - Feature Photo) or without a feature (Photo Gallery). 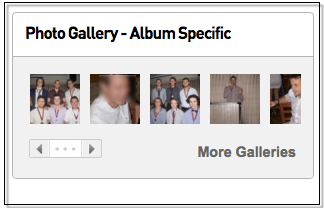 The Photo Gallery - Album Specific widget allows you to choose a specific album to upload (not just the most recent). 2. 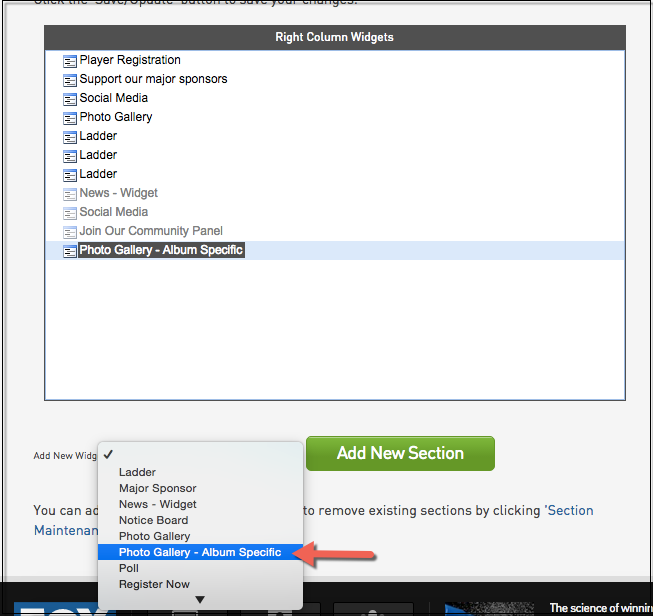 Select Photo Gallery - Album Specific from the Add New Widget drop down list and click on Add New Section. 3. 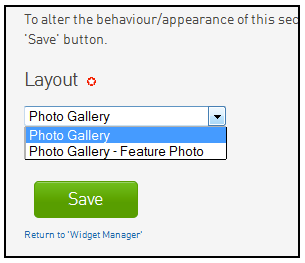 Once the new widget appears in the list, right click over 'Photo Gallery - Album Specific' and click 'Edit'. 4. Choose the album you wish to display and make your way back to the Widget Manager page. 5. Right click over 'Photo Gallery - Album Specific' (you can change this name at any time by double clicking on the name) and click 'Active'. 5. To move this Album click and drag it in to position in the available list. The Album will now appear on your website. 2. From the Add New Widget drop down list, select Notice Board and click on Add New Section. 3. Right click on the Notice Board section and select Edit from the menu. 4. Type the message you want to appear on the Notice Board into the Text Editor. 6. Click on Save when finished. 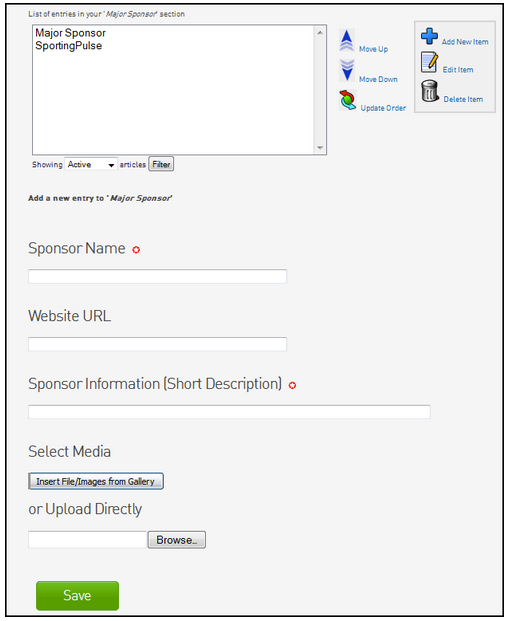 This section (as opposed to the Major Sponsor widget) can display your sponsor logos (and links to their websites) in the right hand column of your site. The ‘Sponsor Information‘ section is best utilised by setting it to ‘rotate‘ mode. This will increase the size of the sponsor images to 200 x 200 pixels (compared to 100 x 100 pixels when set to display as a ‘list‘). 2. If you do not already have a ‘Sponsor Information‘ section on your website, select ‘Sponsor Information‘ from the ‘Add New Widget‘ drop down list and click on Add New Section. 3. 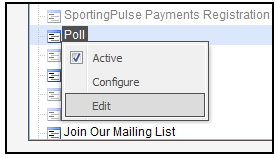 Right click on the ‘Sponsor Information‘ section and from the menu select Configure. 4. 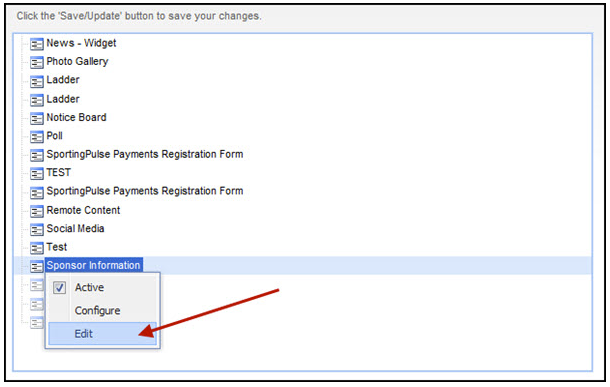 From the ‘Layout‘ drop down list, select Sponsors – Side List Rotating. 5. There are two more configuration options available – (1) to display borders around sponsor logos and (2) to display a heading (eg. 'Our Sponsors') above the sponsor logos. Set your preferences and click on Save Configuration. 2. Enter in your Sponsor’s information as you need. 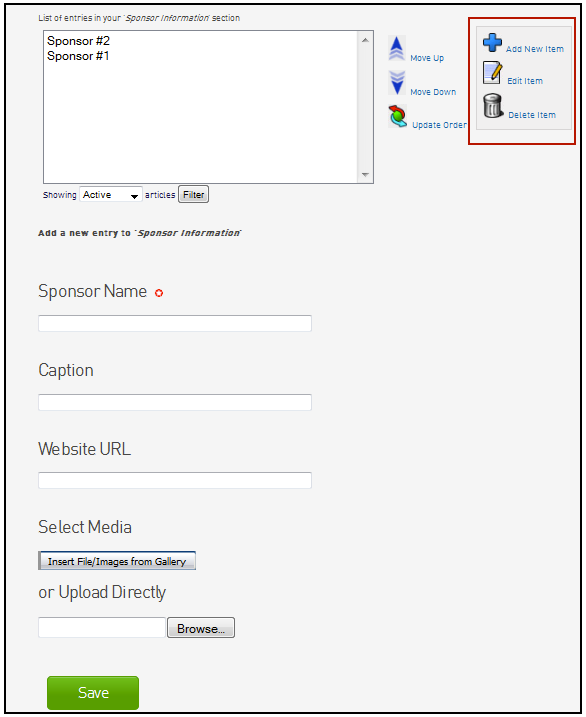 You can include the Sponsor Name, a Caption, a URL link to their website and a logo or image file (either from your media library or directly from your computer hard drive). To Add/Edit/Delete any sponsor information you have entered in to your widget, click on the appropriate button in the right hand corner. PLEASE NOTE: This widget is not linked to the Sponsor Information section (in the Content Manager) or Major Sponsor widget in any way; these are separate sections that need to be maintained separately. 2. 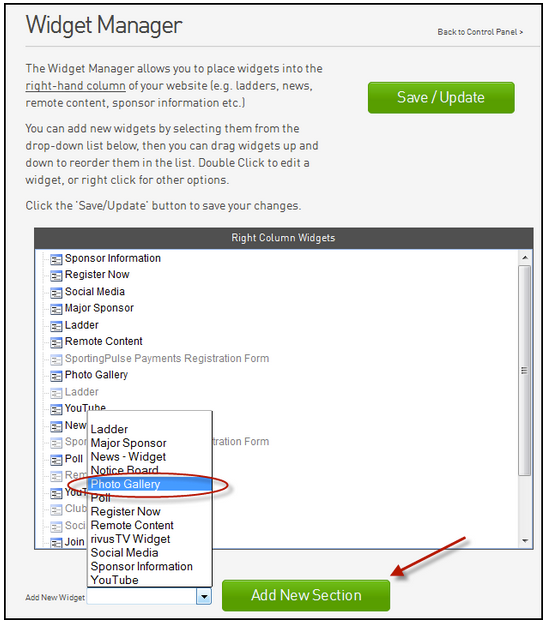 Click on the Add New Widget drop down list, select Ladder, and click on Add New Section. 3. Right click on the Ladder section and select Edit from the menu. 4. Select which competition ladder you want to display from the drop down list (competitions uploaded through Sportzware Central will be available to select). 5. Click on Save to add the ladder for this competition to the right hand column. 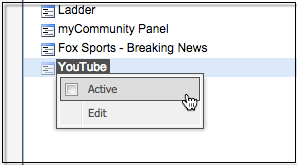 To add the YouTube widget to your website, in the Website Editor Control Panel click on the Widget Manager menu. Scroll down to the Add New Widget section. The YouTube widget will then appear at the bottom of the list of widgets for your site. Initially it will be grey in colour, which means it is inactive. 4. To make the widget active right click on YouTube and check the Active box. 7. 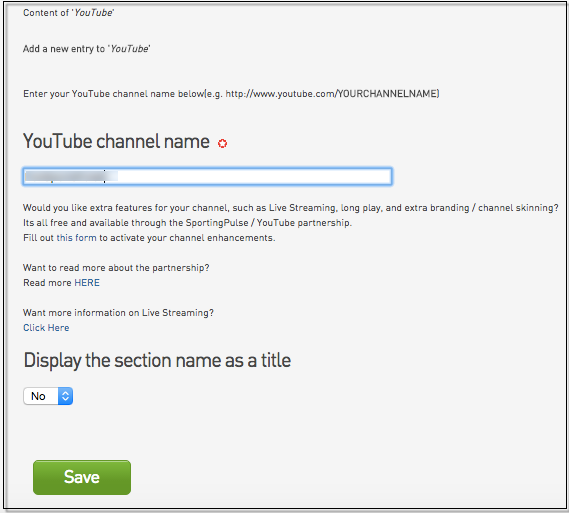 You then need to enter the name of your YouTube channel, this name will appear at the end of the domain of your channel page (as highlighted below in red). 8. Type in the name of your YouTube Channel and click Save. 9. Return to the Widget Manager and click Save/Update. 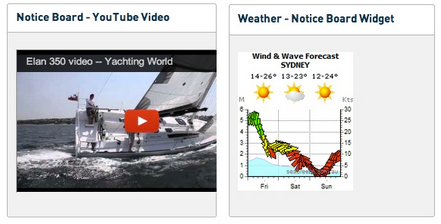 When you return to your website you will see the YouTube videos in the right hand widget. Please note that if you have added new videos to your YouTube channel it may take a few hours for them to appear on your website YouTube widget. 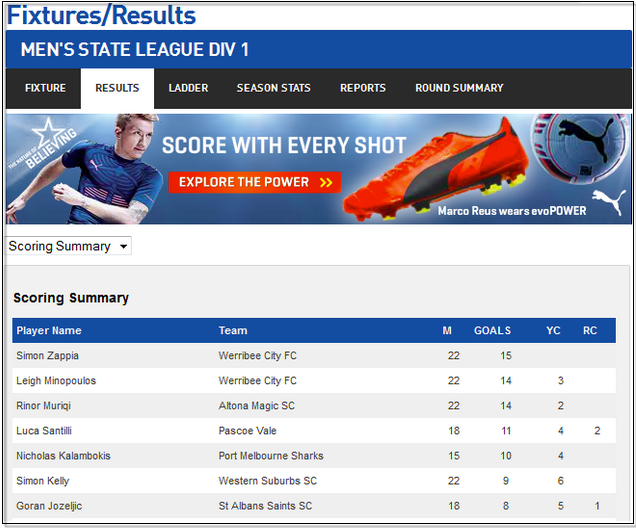 Associations that use Sportzware Central to upload their competitions to their website will now see an additional section in the Widget Manager called ‘Club Links‘. 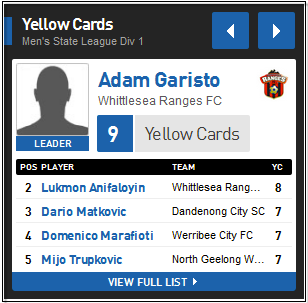 This provides quick access to any club website. 1. The Club Links section should appear in your right hand column. To confirm this, click on Widget Manager from the Site Administration Control Panel - there should be a page titled 'Club Links'. 2. To set whether your Club Links display as a list or logos you need to return to the Site Admin Control Panel and click on Customise Your Website. 3. 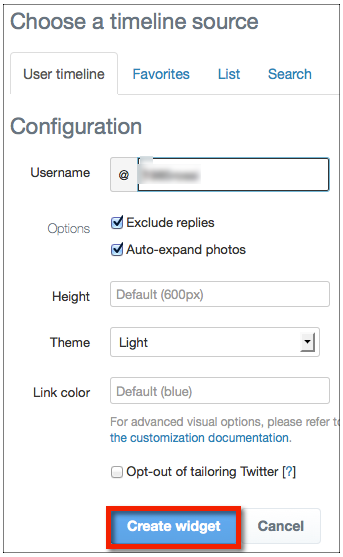 Click on Advanced Configuration. 4. Click on Other Configuration. 5. Go to the second option on the ‘Other Configuration‘ screen – ‘Club List (Widget) format‘ – and select from ‘Drop Down List‘ or ‘Icons‘*. 6. Click on Save Options. 7. Return to the Widget Manager, right click on the ‘Club Links‘ section and tick the Active box to activate it. * If you select the ‘Icons‘ option, each club will need to have its logo uploaded to its club website. 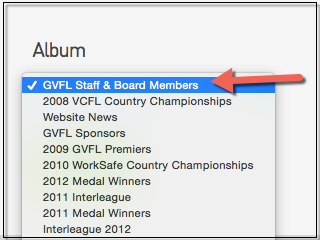 If your clubs have not done this themselves (or don‘t use their club website), association website editors are able to log into the admin area of their club‘s websites and upload club logos themselves. 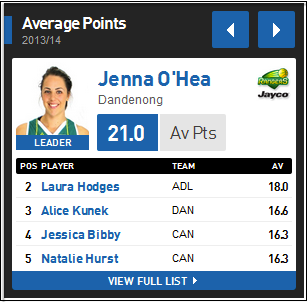 Competition stats and ladders have always been an extremely popular part of the SportsTG offering. This widget will show the top five in a stats category for your chosen competition and will appear in your website's right hand column, along with the rest of the widgets we provide. 1. 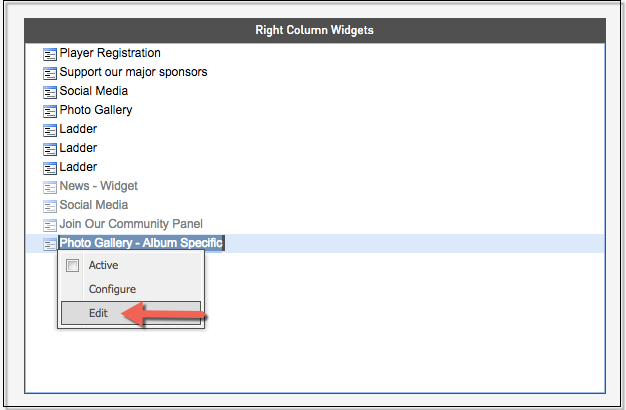 Here is how to set up this feature: Click "Widget Manager". 2. Under add new widget select "Stats" then add new section. 3. Click "Edit" (you will need to click "Active" when you want it to appear to the public). 4. Choose your competition press "Save".